Chicago—Last year’s wave of teacher strikes spread to the first charter school strike in the nation. Teachers struck Acero charter schools on Dec. 4-9, and forced Acero/UNO into a settlement by the weekend. They were demanding more than wages—the teachers are members of a special division of the Chicago Teachers Union, but their pay falls far short of public school teachers. Sarah spoke for many when she said they walked out to get dollars into the classrooms. 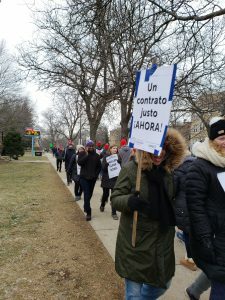 The CEO of Acero/UNO, Rich Rodriguez, makes as much as the superintendent of Chicago Public Schools with its hundreds of schools, while it is teachers that pay for classroom supplies. Sarah, a dance teacher, bought all 50 pairs of tap shoes her students were using. A special education teacher, Jody, bought everything her students needed. Teachers were adamant that the paraprofessionals and aides in the school get fair wages as well. An elementary schoolteacher at Cruz K-12 School said: “We are on strike for two primary reasons, fair pay and smaller class sizes. We are paid less than the average Chicago schoolteacher, especially considering the hours we work. Our capacity of 32 kids is too many kids to handle. The more students, the more money the network gets. “Acero serves a Latinx community with students from immigrant backgrounds. We need to be able to address what they’re going through in a culturally competent way. That means providing protection, especially in this politically tumultuous time, and becoming a sanctuary network, with guarantees that data would not be shared with an agency like ICE. “Every parent I’ve talked to has been supportive. They understand the issues that the teachers are going through because their kids are going through them too. I see an immense amount of support and solidarity from families, from other neighborhood organizations, from political officials throughout the city, and that has been very, very inspiring. Picket line of teachers, students, and parents at Cruz K-12 school during Acero charter schools teachers’ strike in Chicago, Dec. 6, 2018. Photo: Terry Moon for News & Letters. A high school special education teacher at Cruz told N&L: “We’re on strike because Acero, which has over $10 million in ready cash, cut over $1 million out of the classrooms last year. We need them to put it back in our classrooms. Acero, a nonprofit organization, is trying to build a profitable company using taxpayer dollars intended to educate our kids. Our CEO makes more than the CEO of Chicago Public Schools for about one-fortieth of the students and one-fortieth of the schools. This entry was posted in Articles and tagged Acero, Bob McGuire, charter schools, Chicago teachers strike, Chicago Teachers Union (CTU), classroom size, Franklin Dmitryev, ICE, Rich Rodriguez, sanctuary campus, special education programs. Bookmark the permalink.